Replacement springs and rope for your EasyTroller Trolling Plate. Say goodbye to bent or damaged trolling plates. 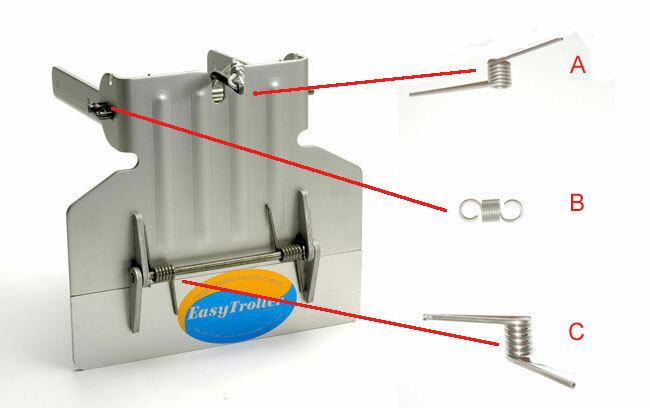 The EasyTroller trolling plate's patented spring hinge design flexes upward to prevent damage to the trolling plate under accidental acceleration. The optional hydrofoil trolling plate model combines two products into one to improve fuel economy and performance. 50 hp and up 14.5"
30 to 45 hp 12""
30 to 45 hp 12"
Learn why an EasyTroller trolling plate with its patented spring hinge design is considered the top-of-the-line in trolling equipment. Fisherman have come to rely on EasyTroller for years of worry-free trolling. Q. What size motor does the EasyTroller fit? EasyTroller short is for outboards 30 to 50 horsepower. EasyTroller standard is for boats with 50 to 300 horsepower. Fins can be used with short and standard EasyTrollers. Q. What type of engines will the EasyTroller mount too? The EasyTroller will mount to both I/Os and outboards. Q. What do the EasyTroller fins do? Do I need them? The EasyTroller fins work as a hydrofoil. If you currently use a hydrofoil then you will need to purchase the EasyTroller with fins. A separate hydrofoil won’t work with the EasyTroller. The fins are a separate module that can be added to any EasyTroller in the future if needed. Q. Can I use a separate hydrofoil with my EasyTroller? No, both products bolt to the cavitation plate and will interfere with each other. The EasyTroller Hydrofoil Fins are designed to provide hydrofoil lift in conjunction with your EasyTroller Trolling Plate. Q. How slow will the EasyTroller slow my boat? The EasyTroller can slow a boat down to 1 mph. Q. How do I mount my EasyTroller? The EasyTroller will bolt directly to your engine’s cavitation plate with included mounting hardware. Q. Will I need to drill holes for mounting? Yes, you will need 4 holes in your cavitation plate for proper mounting. If you have existing holes from another application, you may be able to modify the EasyTroller to work with your existing hole pattern. Q. Will my EasyTroller bend if I leave it in the down position and accelerate? The EasyTroller may bend if it is subjected to high acceleration or high speeds for a period of time. The patented, hinged, pressure release plate is designed to provide a margin of safety in cases of accidental acceleration. How Does an EasyTroller Trolling Plate Work? Trolling plates are a necessity for many fishermen, but they can be an irritating and expensive accessory to maintain. Experienced anglers know that accidentally accelerating before raising the trolling plate can cause the propeller’s force to bend the plate or break its shear pins. Ironwood Pacific has incorporated an elegant solution to that problem in the EasyTroller Trolling plate. The patented pressure release hinge design helps prevents bending the plate due to accidental acceleration, saving fishermen time and money. Under normal operating conditions, the heavy springs hold the lower portion of the plate rigid. When the pressure on the plate reaches a critical point, before damage to the plate is imminent, the springs will flex, relieving the pressure. Once the throttle has been reduced to trolling speeds again, the plate returns to its normal configuration and is ready to troll again. How does the EasyTroller work? With larger or more efficient modern boat engines, many anglers find it difficult to operate their boats at a slow enough speed for optimal trolling effectiveness. With the EasyTroller bolted to the outboard or outdrives cavitation plate, the angler simply throttles back and pulls the rip cord to release the plate. Springs will drop the plate to the down position and it will lock into place, diverting some of the props thrust. This allows anglers to reach reduced trolling speeds of 1 mile an hour or below, while maintaining steering control. When it is time to head out, the angler pulls the rip cord again to unlock the plate, then throttles up. The prop thrust will push the plate back into the up position where it will lock. In the up position the plate offers very little drag and will offer some of the lift benefits of a hydrofoil. For boat that regularly employ a hydrofoil, the EasyTroller’s option hydrofoil fins can be bolted on to increase lift, allowing the angler the benefits of both a hydrofoil and a trolling plate. The EasyTroller comes in a short model for outboards 30-45HP and a standard model for outboards or outdrives 50 HP and up. Either model can be equipped with Ironwoods Pacific unique Hydrofoil Fins. These optional fins are made from anodized aluminum, mount quickly and easily, and can improve planing performance and fuel efficiency. Both models ensure that the trolling fisherman will spend his day cruising for fish on the lake rather than cruising to town for repairs. The EasyTroller is one of Ironwood Pacific Outdoors’ premium, problem-solving boating accessories. The EasyTroller is made in the USA with tough, marine grade anodized aluminum and stainless steel components. Many trolling plates will fail under the pressure of accidental acceleration with the plate locked in the down position. EasyTroller’s patented Pressure release plate allows the lower portion of the plate to flex under extreme pressure, releasing the pressure before the plate is damaged. The EasyTroller may be mounted on top or on the underside of the anti-cavitation plate (most EasyTrollers are mounted on top of the cavitation plate). Position the EasyTroller on the cavitation plate so that the EasyTroller plate is at least 3 inches (4 to 6 inches is ideal) behind the prop while in the vertical down position, being careful to ensure that the holes in the cavitation plate are not too close to the edge of the plate. Once positioned, carefully check all clearances to make sure that the plate rotates freely through the upward and downward positions without interference with the prop or any part of the motor. Clamp the EasyTroller mount plate to the anticavitation plate using two small C clamps. Note: The EasyTroller plate typically covers only one half to three fourths of the prop when in the down position. Drill a 5/16” or slightly larger hole in the anti-cavitation plate through an existing hole in the mount plate. Note that the mount plate has six holes to accommodate various anti-cavitation plate shapes. Use the forward two mounting holes and two other holes that work best on your motor. (New holes may be drilled in the mount plate to accommodate an existing hole pattern if they are spaced at least 1/2” from an existing hole.) Install a bolt(one washer under the bolt head and one under the nut) to hold the mount plate in position while the next hole is drilled. After the second bolt is installed, the remaining two holes can be drilled and the bolts installed. Be careful not to over tighten the bolts to avoid damage to the anti-cavitation plate or inhibit the trolling plate rotation. Once installed tie off the release cord in a convenient location, leaving enough slack so the motor can swing full left and right. Special Notes for Volvo Outdrives: Longer bolts may be needed on Volvo outdrives with hollow cavitation plates. On Volvos with rubber exhaust flaps allow enough room so that the flap can fully open when the plate is in the down position. The EasyTroller may not work with some Volvo or Mercury Dual-Prop engines due to a lack of clearance with the props. The fins model must always be mounted on top of the cavitation plate. Position the left fin against the mounting plate and fasten with the carriage bolts, washers and nuts. The carriage bolts should be installed from the inside (motor side) of the mounting plate, the washers and nuts from the outside. See the image at the right to see the proper fin positioning. Tie off the release cord near the center of the boat with enough slack for the lower unit to go into the full down position and rotate full left and right. The EasyTroller should always be in the up position when running at speed. When you want to troll, put the motor in neutral and wait for the boat to come to a complete stop. Pull the cord and the plate will move into the down trolling position. The plate will lock into place when properly seated, slowing the boat’s trolling speed. When you are ready to move at speed, release the EasyTroller plate by pulling on the cord with the motor idling and in forward gear. Once the plate has released, accelerate slightly and the plate should raise and lock into the up position. If the plate does not come all the way up to the locking position you may have to increase your speed a bit more. While the EasyTroller will absorb most accidental accelerations it can be bent or damaged under extreme conditions or if kept in the down position while running at speed. Ironwood Pacific Outdoors, Inc. will not warrant the plate under these conditions but exchange/repair options are offered at favorable prices. Contact service@ironwoodpacific.com for more details. The EasyTroller should be set in the downward position when transporting your boat on a trailer. Ironwood Pacific Outdoors, Inc. accepts no responsibility for damage incurred to the boat, engine, anti-cavitation plate, or propeller through use of the EasyTroller. Click here to open diagram in new window. If you find you have additional questions, would like more information on any of our EasyTroller trolling plates, or just need some help selecting the best product for your boat, please contact us. We will be glad to help! We offer free shipping on all orders within the Continental United States. Items purchased through the Ironwood Pacific website are typically processed and ready for shipment within 1-2 business days. During the summer months (or right before a holiday) this could change to 3-4 processing days. Please call to confirm current lead times before placing your order. 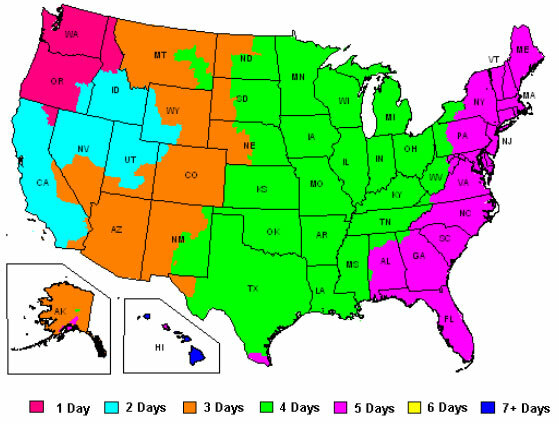 For orders within the lower 48 states, we ship with either FedEx or USPS ground. Please call for available express options and applicable shipping charges. There is no sales tax in Oregon, so we do not charge sales tax on U.S. orders, regardless of your destination. For shipments to destinations outside the continental United States, we will be happy to provide you with a quote. Please complete our Shipping Quote Request form. Copyright © 2019 IronwoodPacific. All rights reserved.